I love feeding people. Nature or nurture, I don't know, but I do know that every time we visit my very Filipina grandma the first thing she says (after "Oh! You're getting so big!") is, "Are you hungry? Do you want something to eat?" Add to that the years of game nights with friends and family that start and end clustered in the kitchen, and it becomes easier to see why I give away the majority of the food I create. There's a definite pattern to the disappearance of my baking bonanzas and cooking culminations. First is the creation, which is occasionally interrupted by knocks on the door from Christian's empty-fridge-neighbor Luke and "what smells so good?!" from passers-by. Then is the hand-slapping until I deem the baking/cooking ready for ingestion, which is occasionally too reminiscent of scolding the family pet. Finally the consumption commences, starting with whoever happens to be in the room at the elusive moment when the food is "cool enough" or simply "done." I eat some. Christian normally eats some, unless he's trying to be healthy and the product is definitely not (and even then I'll catch him sneaking little nibbles). I go knock on the neighbors' doors, and they eat some. Once, after christening a pie plate with 7-layer dip, one neighbor told another and he came to eat some, too. If it's baked goods, I put some on a plate and bring it to the across-the-hall neighbor who I've never talked to aside from these exchanges and asking for a hammer. 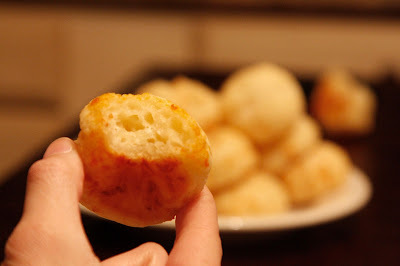 If, however, there's still some of whatever it was left after the horde descends and it's best eaten fresh or if it's too dangerous to sit and tempt me in the kitchen (or both - looking at you, Brazilian cheese bread puffs), then I pack it up and tote it along wherever I'm going that day. 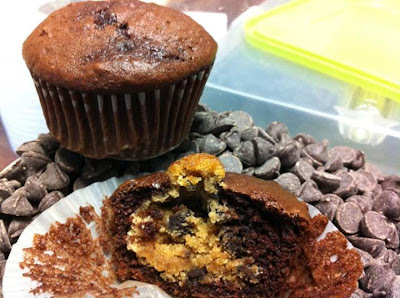 Chocolate-chip cookie-dough chocolate cupcakes go to my friends' dorm. Then I go back to the room to find that Christian has been snacking mindlessly while he programs, so I rescue the remaining food (and save some for myself). Throughout the rest of the day, I normally keep eating until I recognize that I'm sliding back and forth along a familiar teeter-totter of self-congratulation for being such an amazing cook and self-deprecation for WHAT AM I DOING how did that cookie get in my hand?! So I resume offering the goodies to people, often a little more insistently this time around. Living in college dorms may not be great for privacy or feng shui or flu outbreaks, but it sure makes it easier to share food and do what I love. I love feeding people. I love the initial moment of disbelief when I offer them a fresh-baked cookie or steaming plate of spaghetti. I love the unadulterated joy that lights up their faces when I reassure them that yes, I'm serious, please help yourself. I love the sounds of contentment that people unconsciously make as they indulge themselves just because, the tell-tale combination of eyes-shut-throat-humming. I love knowing that I've made their day just a little better. I love thinking that maybe I've helped assuage a hunger that goes beyond the stomach.